One fine evening a young princess went into a wood, and sat down by the side of a cool spring of water. She had a golden ball in her hand, which was her favorite plaything, and she amused herself with tossing it into the air and catching it again as it fell. After a time she threw it up so high that when she stretched out her hand to catch it, the ball bounded away and rolled along upon the ground, till at last it fell into the spring. The princess looked into the spring after her ball; but it was very deep, so deep that she could not see the bottom of it. Then the frog put his head down, and dived deep under the water; and after a little while he came up again with the ball in his mouth, and threw it on the ground. As soon as the young princess saw her ball, she ran to pick it up, and was so overjoyed to have it in her hand again, that she never thought of the frog, but ran home with it as fast as she could. The frog called after her, “Stay, princess, and take me with you as you promised.” But she did not stop to hear a word. By the fountain cool in the greenwood shade. 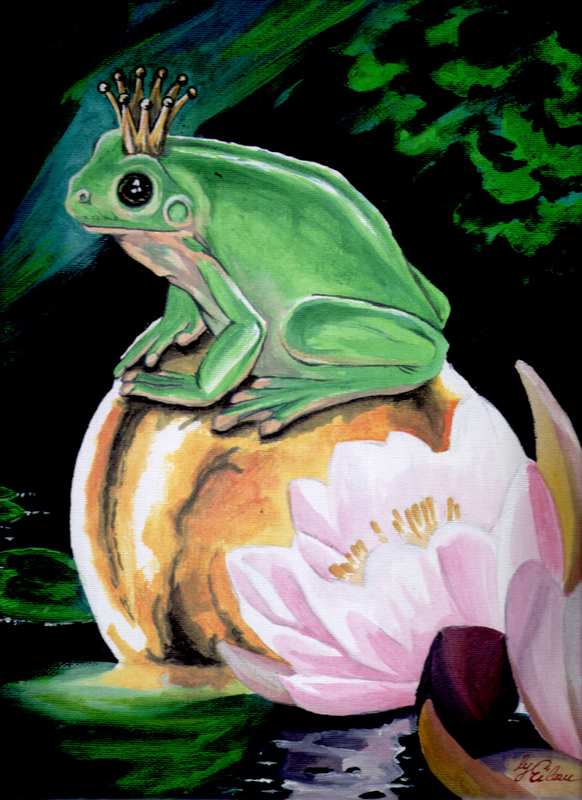 Then the princess ran to the door and opened it, and there she saw the frog, whom she had quite forgotten. She was terribly frightened, and shutting the door as fast as she could, came back to her seat. The king, her father, asked her what had frightened her. And the princess took him up in her hand and put him upon the pillow of her own little bed, where he slept all night long. As soon as it was light he jumped up, hopped downstairs, and went out of the house. But she was mistaken; for when night came again, she heard the same tapping at the door, and when she opened it, the frog came in and slept upon her pillow as before till the morning broke. And the third night he did the same; but when the princess awoke on the following morning, she was astonished to see, instead of the frog, a handsome prince gazing on her with the most beautiful eyes that ever were seen, and standing at the head of her bed. The young princess, you may be sure, was not long in giving her consent; and as they spoke a splendid carriage drove up with eight beautiful horses decked with plumes of feathers and golden harness, and behind rode the prince’s servant, the faithful Henry, who had bewailed the misfortune of his dear master so long and bitterly that his heart had well nigh burst. Then all set out full of joy for the prince’s kingdom, where they arrived safely, and lived happily a great many years. This entry was posted in Parabola and tagged fml, frog, gold, meaning, words.